This short ride crosses over the Benicia-Martinez Bridge for a counter clockwise lollipop loop along Lake Herman Rd to Columbus Pkwy. The route continues along the Bay Area Ridge Trail to Downtown Benicia and the waterfront area at the end of 1st St. Meander through the Benicia Marina before returning across the bridge to Martinez. The mile long incline across the bridge has an average grade of 4.5% up to the center of the path before dropping to the other side onto Park Rd in Benicia. Enjoy the beautiful views along Carquinez Strait! Turn west and cross over I-680 for the rolling climbs on Lake Herman Rd. This two lane back road has minimal traffic with views of the rolling hillsides and our backyard refineries! The rolling terrain leads to the stop at Lake Herman Recreation Area; there are porta-potties-no water. Continue west on Lake Herman Rd to the cattle ranch and farm buildings around Sky Valley. From the Sky Valley, there is a short climb towards quarry at Syar Industries; it’s 0.4 mile with 6-9% grades. Lake Herman Rd ends at the outskirts of Vallejo at Columbus Pkwy. Meander along the trail around Benicia Marina to the exit at Turnbull Park. 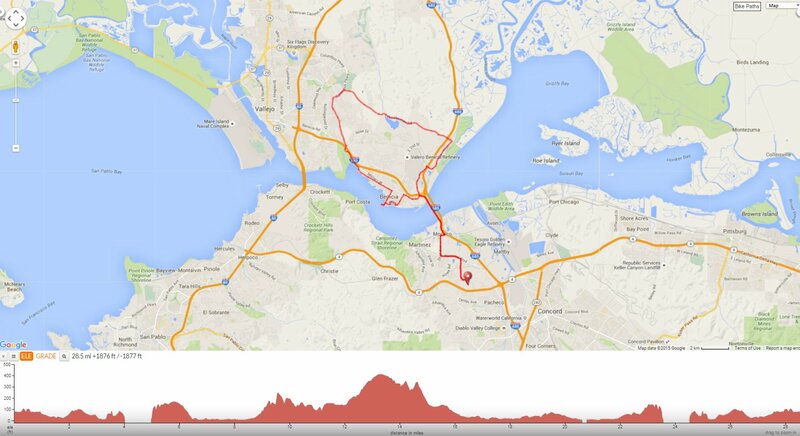 Take E 5th St and Military E to Jefferson St, the road leads back to the Benicia-Martinez Bridge trail off Park Rd. From the Benicia-Martinez Bridge, simply reverse the route back on Shell Ave, Pacheco Blvd and Morello Ave to Holiday Highlands Park. Not every ride has to be long and arduous, this short scenic ride is just enough to get the legs spinning without having to be out in the cold for too long. Weather: Sunshine with cool temps ranging from the mid 40’s to the mid 50’s with SE winds.